Golden Retrievers are not violent or stubborn by nature. They are peace-loving creatures who prefer to stay quite low profile. They rarely get into fights with other dogs, or seldom intend to hurt humans as well. Having said that, there may be times when your Golden Retriever just turns into a biting machine. When that happens, it is almost always due to some external reason and has little to do with the dog itself. Read on to know more about why your dog may be biting the ones around them, and what you can do to control it. This is equivalent to solving more than half of the problem itself. If you realize what is making your dog behave the way it is behaving, you can take measures to curb that reason and have it blended in a way that your dog likes. For example, your Golden Retriever may feel threatened by a certain person and may run to bit them whenever they area round. In this case, you can send your dog away whenever such people visit you. Relevant dog training also helps a lot in such cases. You may be home-training them or sending them to an institute, make sure they learn their lessons of not biting any human. 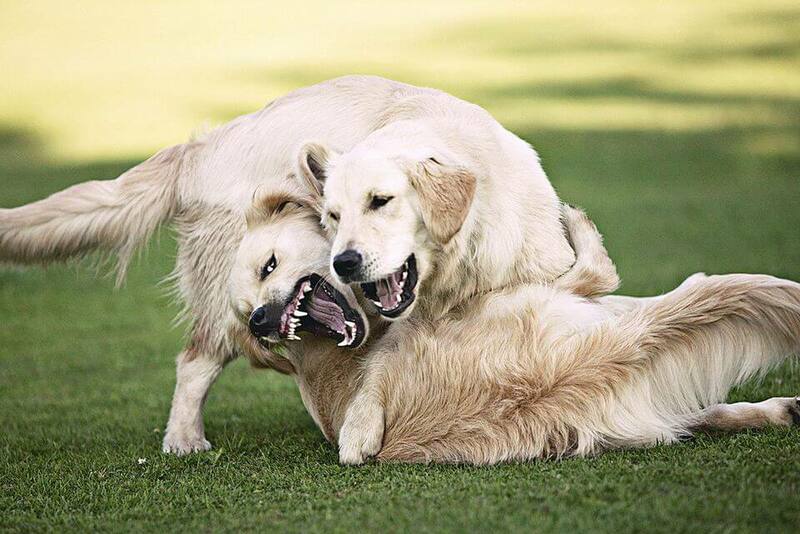 Adults can even tackle and put up a fight if a Golden Retriever tends to attack them. But if your dog decides to go after a kid, it can do serious damage. Hence, this important lesson must be taught to them, no matter what. Also, ensure that they pay heed to the lessons and abide by them. One of the few useful tactics is to treat your Golden Retriever well. Your dog may be biting due to certain issues like you being harsh and strict with them. Which is why it is important to be soft with them. This is true for Golden Retriever pups as well as adult dogs. Present them with their favorite cookie or a swimming session if they behave well as per their regular standards. The best treatment is to reward them when they do good instead of punishing their bad behavior. Keep your punishments less, low, and subtle and your rewards massive and frequent. Aggression and irritability may result in your dog becoming stubborn over time. Also, stubbornness even leads to biting issues in dogs. Hence give them the required training necessary to curb biting issue and keep their stubborn attitude under control. True that it is easier said than done, but your dog sure must learn to obey your commands on the go. Train them so well that they don’t resort to biting as an option, and even if they do, they control it as soon as they don’t seeapproval from your end. Include your family and friendstoo and tell them about what you plan to do with the biting issue of your Golden Retriever. Educate them on what to do and what not if ever they encounter your Golden Retriever biting or throwing tantrums in your absence. It is always better to have the entire family working towards a common goal of training your dog instead of just one person doing it alone. Golden Retrievers are nothing less than kids, and it takes the combined effort of the entire family to instill mannerisms in a child. So is true for a dog too. Golden Retrievers are soft and humble by nature. Which is why you won’t easily find a Golden Retriever who sports biting issues. But if your Golden Retriever happens to be one such dog, make sure that you get to the root of the issue instead of just being superficial about it. Remember that no matter whatever issue it may be, hope is never lost. With the proper training and technique, one can very well be assured that any Golden Retriever can be brought back to normal sans its biting issues.